» A geographical indication (GI) is a sign that identifies a product as originating from a particular location which gives that product a special quality or reputation or other characteristics. Well-known examples of GIs include Bordeaux (wine), Darjeeling (tea), Blue pottery of Jaipur and Tuscany (olive oil). » In order to function as a GI, a sign must identify a product as originating in a given place. » The GI tag ensures that none other than those registered as authorised users (or at least those residing in the geographic territory) are allowed to use the popular product name. » Darjeeling tea became the first GI tagged product in India, in 2004-05, since then by May 2017, 295 had been added to the list. » The famed Uttarakhand tejpatta, a popular spice used extensively in the hilly cuisine, has been awarded a geographical indication (GI) certificate making it the first product indigenous to the state to have made it to the GI list. » Kerala’s Nilambur teak known internationally for its superior timber quality and elegant appearance will be added to the list of Kerala produces with the Geographical Indication (GI) tag. » In this regard, IPR Cell of the Kerala Agricultural University (KAU) with the support of the Nilambur Teak Heritage Society, the Kerala Forest Research Institute (KFRI) and the Department of Forests have applied for GI tag. » Banganapalle Mango of Andhra Pradesh got the coveted GI tag in 2017. » India has 236 GI products registered so far and over 270 more products have applied for the label. » The Hyderabad Haleem is perhaps the only Indian dish to have got a GI status. A geographical indication (GI) is a name or sign used on certain products which correspond to a specific geographical location or origin (e.g. a town, region, or country). India, as a member of the World Trade Organization (WTO), enacted the Geographical Indications of Goods (Registration and Protection) Act, 1999 has come into force with effect from 15 September 2003. GIs have been defined under Article 22(1) of the WTO Agreement on Trade-Related Aspects of Intellectual Property Rights(TRIPS) Agreement as: "Indications which identify a good as originating in the territory of a Member or a region or a locality in that territory, where a given quality, reputation or characteristic of the good is essentially attributable to its geographic origin." · It is the name of a person or a predecessor in a particular business. What is a protected geographic indication? 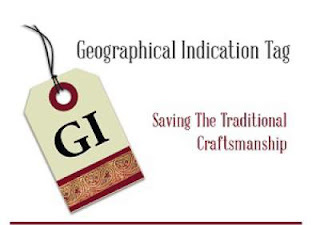 The GI tag is an indication which is definite to a geographical territory. It is used for agricultural, natural and manufactured goods. For a product to get GI tag, the goods need to be produced or processed or prepared in that region. It is also essential that the product has special quality or reputation. An appellation of origin is a special kind of geographical indication generally consisting of a geographical name or a traditional designation used on products which have a specific quality or characteristics that are essentially due to the geographical environment in which they are produced.